Post courtesy of Renegade Dietitian Alex Black. Checkout the Daily Challenge below! Helen Keller once said: “life is either a daring adventure, or nothing “, and I’d have to say I agree with her. If you think about it, everyday presents a new opportunity to learn something new or for something completely awesome to happen. And of course we always have the opportunity to make our own adventures. As part of the Renegade Challenge, we’ll be learning and trying all sorts of new things over the next month on our journey to become better athletes and better people. So if we think about life as an adventure, shouldn’t we think about the food we eat everyday the same way? Some already do. Over the past ten years the food industry has gotten pretty creative about what they offer. They try lots of new stuff, like cereals that look like cookies, bagel “stix” prefilled with cream cheese, pink milk, white chocolate flavored peanut butter, purple ketchup… I could go on. If you’ve ever walked down the snack aisle of a supermarket, you know what I mean. Food companies spend millions of dollars coming up with creative new “food” items. But when you start eating more healthy unprocessed foods and making meals and snacks yourself, it can get a little more difficult to be creative. How often do you pack the same sandwich for lunch? Make the same breakfast for a month straight? Eat the same post workout snack every day? It’s so easy to fall into a food rut. But that gets boring. And when your diet becomes boring, it’s all to easy to start letting the food companies be creative for you. Enter the nutrition bar with 19 ingredients and the TV dinners that don’t taste nearly as awesome as home cooked meals. But today’s challenge is about BREAKING FREE! Get out of the food rut. Do something different with food. It doesn’t matter if you try a food you’ve never tried before, eat a food you eat all the time in a different way, make something from scratch that you normally make with packaged ingredients, buy something completely weird and try it out, or just eat a food you used to eat all the time and haven’t had since you were a kid. Just do something adventurous! And of course, tell us how it went in the comments. Eat Something Adventurous!!! Share your experience! 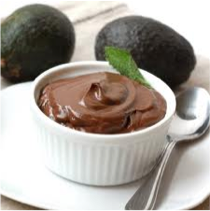 And to help get your creative juices flowing, this week I am sharing the recipe that inspired this post: chocolate pudding made with avocados. Because who would have thought you could make pudding with an avocado?! But it’s delicious! And it’s pretty rich so a few bites will satisfy that sweet/chocolate craving with some healthy fats and less sugar than regular pudding. Just mix it all in a food processor or blender until smooth and enjoy! If you don’t have a food processor, you can just mix it all up in a mixing bowl with a potato masher. It may come out a little lumpier but it’ll also make clean up a little easier. This entry was posted in Motivation, Nutrition and tagged daring adventure, food by Renegade Rowing. Bookmark the permalink. Yum, that looks amazing!! 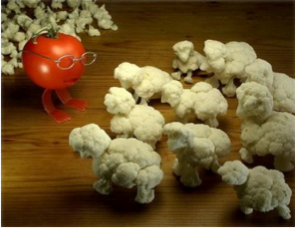 And the picture of the cauliflower “sheep” is totally cute. I went to Whole Foods today and bought fiddleheads! They are so delicious (in an asparagus-y kind of way), and only in season for a very short time — blanch ’em, then a quick sautee with lemon, garlic, & pepper, and they’re good to go! I went to the local Whole Foods and got some soy nuts, i dont know what they are but they sure taste good! I ate a bell pepper whole like an apple instead of slicing it like I normally do. Not too bad and it cuts out a prep step! I had some indian food and it was YUMMY!